Now with a new image. 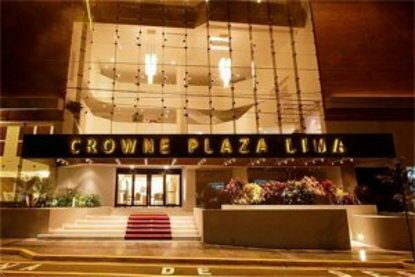 Magnificently suited for business and pleasure, the Crowne Plaza Lima Hotel is centrally located in the heart of the financial, commercial, cultural and tourist district of Miraflores. Minutes from tourist attractions, beaches and recreational areas, as well as some of Lima&regs best restaurants. We are proud to offer 43 comfortable guest rooms with over 25 square meters of space. Our 44 suites, with over 66 square meters are the perfect getaway for business and leisure travelers. Our Executive Suites, are elegantly decorated and equipped with the ultimate technology. Guests staying at our Club Floor suites, enjoy upgraded room amenities, as well as complimentary access to our Executive Lounge. The Executive lounge offers breakfast and afternoon drinks and canapes. Our Executive lounge also offers a work station with complimentary Internet access. We look forward to welcome you to your home in Lima. Let us Pamper you with our personal and excellent service at the Crowne Plaza Lima.